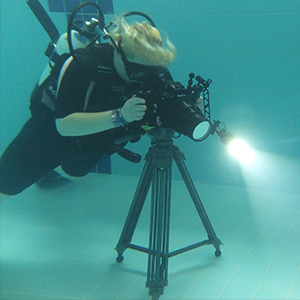 Underwater filming is hard. First of all, scuba diving was one thing to learn and I was literally thrown in the deep with a camera in one hand, a regulator in my mouth and a BCD on my back. Learning to dive was a difficult and scary experience. The water wrapping around you and pushing you down was a very unsettling sensation. Yet once I was down there and swimming through plane wrecks and placing lights under rocks, I started to really enjoy myself. On the one hand remembering to breathe was hard enough, but having to think about different lighting and different sorts of exposures when filming underwater was another thing. For example, I became aware that being underwater requires a lot more use of lighting, using red light to filter out the blue background, as water absorbs so much light. to the standard video procedures we have been taught on our television course. I learnt about larger F stops to get up close to the subject, and the detail this revealed in shots was amazing. Underwater filming has made me realise there is a lot more to just jumping into the water with a camera. A lot more pre-production has to be completed to make sure the dive will be safe, as well as interesting and well-planned. This experience has led me to feel more confident and more likely to go into the production process of underwater filming. My course has helped me come across a variety of television jobs that I have never considered before; advertising, sports, journalism and of course documentary filmmaking. It has opened up a totally new side of television opportunities to me, and I feel really inspired to find out more. This is how I feel about underwater filming, and I am now confident that it's something I want to do in the future. It is an interesting and diverse skill that sits proudly on my CV. After studying with Triton Scuba on how to dive and why to dive, it has also taught me to care a lot more about ocean conservation and I hope to be able to use my new found skills for helping to inform the world that there is a lot more to the ocean than you might think. I am still currently diving and gaining experience so I can hopefully work on some more underwater projects when I get some more diving experience. to grab the opportunity with both hands and two flippers! . There is no limit to where you can go (depending on the size of your oxygen tank) and there are so many things to see in this mysterious world. Grab the opportunity with both hands and two flippers!